The first birthday of one’s baby is certainly something to celebrate. Parents might want to throw a party and buy him or her special present to show their immense love and happiness. It was around 10 am on November 18. Clad in their best party dresses of pink and blue, birthday boys and girls who were to celebrate their first year were waiting at the ‘Raja Gedara’ last Friday to welcome the VVIP. Not being aware where they were and whom they were to meet, tiny tots, some screaming at the top of their voices, while some were sleeping in the warmth of their mothers arms. The 1,000 infants were not just ordinary tiny tots, but are ‘Mihimeth Daruvo’, special name given to children who were born on this special day. They were the fortunate lot, for whom the doors of the much guarded house - Temple Trees- was opened and had the opportunity for mingling with the ‘much-guarded’ person of the country, on the day they celebrated their first year of existence in this world. The special birthday ‘boy’, who was to celebrate his 66th birthday, was warmly welcomed by parents whose were given an opportunity to realise their life time dream. With no difference in caste or creed, the 1,000 babies selected from each Grama Seva division, representing the four corners of the country were invited for the charming but unique, but yet simple birthday ‘bash’. The special birthday cake was cut and shared with them. President Mahinda Rajapaksa - the ‘father’ of the country’s children and who has special love for them equal to his own sons – did not forget to share a moment with children on his special day. It was his 66th birthday that these tiny tots received an invitation to enjoy a moment with him. Each baby was given a ‘Mihimeth Account’ with Rs. 2,000 and a gift to remember the occasion. Each bubbly baby with their parents was given a chance to say ‘Happy Birthday’ to him. They were also given the chance taking pictures with him to make their meeting memorable. No gala birthday bashes, President Rajapaksa setting an example to others had devoted his special day to get the blessings of Maha Sangha and also engaged in a series of religious activities arranged to invoke blessings on him and the country. One major religious ceremony was the ‘Dana’ offered to 1,000 kiri Ammavaru (mothers) and 100 Kiri Appavaru (fathers) to invoke blessings on the President on his birthday and the country held at the Narahenpita Abhayaramaya. Ven. Murththettuwe Ananda Thera, Chief Sanghanayake Thera of the Western Province and Narahenpita Purana Viharadhipati, who organised the ‘Pinkama’ said heroes were born rarely and people should pay gratitude to the hero in recent Lankan history who liberated the country from the 30-year-old scourge of terrorism and put a strong foundation to the country’s future. The President visited the Peliyagoda Vidyalankara Pirivena in the morning and paid homage to the Sacred Relics and obtained blessings. Chancellor, Vidyalankara University and Parivenadhipati Vidyalankara Pirivena Ven Prof Welamitiyawe Kusaladhamma Nayaka Thera in a brief Anusasana said the President has enabled future generations to live in peace without fear or suspicion by ending the world’s most dreadful terrorism within a short period of one and a half years through his proper guidance. Describing President Rajapaksa as a patriotic leader who loved the country, religion and people, the prelate said the President never sought cheap political gains through his actions. The President also exchanged pleasantries with devotees present on the occasion who showered him with birthday greetings, a press release from the President’s Media Division said. Later, he visited the Kelaniya Raja Maha Vihara and participated in special religious observances after calling on the Viharadhipati Ven. Prof .Kollupitiye Mahinda Sangharakkitha and receiving his blessings. The President later visited the Vishnu Devalaya and offered a pooja seeking the blessings of deities and participated in a Pinkama to release several head of cattle saved from slaughter. The President also participated in a social service program where he distributed free books, white canes, spectacles, hearing aids and wheel-chairs among members of needy low income families in the Kelaniya area. On Wednesday, President Rajapaksa unveiled the plaque after laying the foundation stone for a proposed museum building at the Kiri Vehera Raja Maha Viharaya and also participated at an all night Pirith ceremony held at the Viharaya to invoke the blessings of the Triple Gem on him. The Daya Gamage family which was upset with the government’s decision to acquire their assets at Sevanagala had met the President to find a solution. He welcomed them and listened to their plight, but explained that the government had no intention to acquire properties or businesses belong to individuals like Daya Gamage or Harry Jayawardena, but what option did they propose to make a factory profitable when its sugar production, which was at 12 percent, had dropped to five percent. “We want to make the three sugar factories - Hingurana, Pelawatte and Sevanagala - more efficient to facilitate and to protect sugar cane farmers. When the paddy farmers unable to sell their harvest, they at least use the harvest for their own consumption, but sugar cane farmers faces huge losses as sugar cane will fetch a poor price when they are dry. The only option for them to sell their harvest to produce molasses, which gives them a very low price”, he said. President Rajapaksa revealed that over 43 million litres of molasses were produced by the Pelawatte Sugar Company this year and the government had stopped three containers of molasses imported from Pakistan recently. “ When the government gives the assets belonging to people, the management should protect it to protect the people and this decision was not to harm you but for the benefit of people of this country”, President Rajapaksa said. Meanwhile, Opposition Leader Ranil Wickremesinghe also stepped into Temple Trees to discuss issues related to the ‘Revival of Under performing Enterprises and Underutilised Assets Act’, which was passed by Parliament last week. This Act was passed by Parliament with an overwhelming majority after the Supreme Court ruled that the provisions of the related Bill submitted for its ruling were in keeping with the Constitution. The Bill and the subsequent Act passed by Parliament had a clear schedule, which stipulated that business ventures that were found to be under performing and/or having underutilised assets provided by the state, and was clearly and strictly limited to those business ventures and related properties. Wickremesinghe informed the President that he would give his fullest support to the Act but requested to look into Daya Gamage’s plight. President Rajapaksa, who didn’t pay any heed to his request reiterated the government’s stance while explaining to him that it was not only for Gamage, but for all those who were running business ventues inefficiently using public assessts. The President planted the first sapling to kick off the national tree planting program - Deyata Sevana - where 1.1 million saplings were planted in the coutnry last Tuesday. He planted a Na sapling at the Urban Green Park and the ceremony also held to mark the President’s swearing-in for the second term in office and his birthday. Addressing the gathering, the President said that unlike the present government, certain previous regimes had thought that preserving nature was the responsibility of schoolchildren and a few organisations. “From the time we introduced the Mahinda Chinthana we always said that we would give the highest priority to preserve nature. We also introduced policies to supplement such endeavours. We made protecting nature a part of our development plan,” he said. ‘This government is not prepared to subjugate nature in the name of development and it realises that both should go hand in hand. Nations which had not adhered to this reality were facing dire consequences due to their actions. This government as a matter of policy has always granted the highest state patronage to protect and preserve nature”, he said.“When facing challenges we need to use indigenous methods. Whatever the challenge be it environment, terrorism or any other, it is important to use endemic methods to overcome it,” he said. 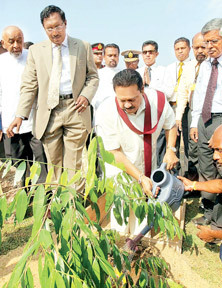 President Rajapaksa said that the use of endemic methods to preserve and protect nature had paid rich dividends. “Due to multiple efforts, Sri Lanka today could stand tall in the global sphere as a country which has achieved significant progress in preserving nature. The preservation of nature since ancient times, has been part of Sri Lanka’s tradition and culture and that was enriched by strong religious values, our ancestors lived intimately with nature. The trees planted by them gives us shelter and life today,” he said. The ‘National Physical Plan’ was handed over to the President by Construction, Engineering Services, Housing and Common Amenities Minister Wimal Weerawansa this week. 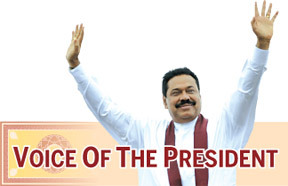 The plan, includes project proposals for Sri Lanka until 2030 and was formulated to bring in massive economic development and to achieve targets of the Mahinda Chinthana Future Vision. The purpose of the document is to detail the plan and identify the large scale projects for the next 20 years and beyond around the country. Such projects are listed to demonstrate to the public, potential investors and donor agencies, the opportunities available in Sri Lanka. A Palestinian delegation led by Mayor of Beitunia, Arafat M.A. Khalaf, who had a five-day official visit in Sri Lanka, had expressed happiness over the progress made by the country during a very short period under the leadership of President Rajapaksa. At the meeting held at Temple Trees, Khalaf commended the services rendered by President Rajapaksa for the cause of Palestine as a President of Sri Lanka-Palestine Solidarity for over 29 years. He also thanked the President for extending support to the Palestinians cause.President Rajapaksa extended Sri Lanka’s support to Palestine in the future too. Khalaf added that they are honoured to have had an opportunity to name a road after President Mahinda Rajapaksa in Palestine. The President is to present his eighth budget in Parliament tomorrow. The leader who always honoest people’s views has consulted cross section of over 2,718 people from different walks of life apart from meetings with ministers, deputy ministers, parliamentarians, government agents and officials to draft the budget proposals for the financial year 2012 in his capacity as Finance Minister. The intention of getting the support of people in all segments was to make the 2012 Budget more people-friendly. President Rajapaksa and the Finance and Planning Ministry had 56 meetings before drafting Budget proposals. Among the people he met were farmers, large scale, medium scale and small scale businessmen, representatives of trade unions, public servants, private sector employees and commissioners and also received comments from women across the country, including those from Vavuniya, North and South and women employed in different sectors.